Robotic agents often have to interact wirelessly with a base station, e.g. a cloud server, in order to exchange critical and confidential information about their mission. However, the wireless medium might be vulnerable to eavesdropping attacks. A recent paper by members of the DCIST alliance introduces the problem of motion planning with secrecy guarantees. A robot needs to track a confidential trajectory, which is planned and transmitted on-line by a cloud server. The work develops novel secure communication codes, which encode the trajectory information and hide it from any eavesdroppers. Meanwhile, the robot is able to recover the trajectory and the cloud is able to estimate the robot’s motion. The coding scheme creates secrets between the robot and the cloud based on i) the randomness of the robot’s motion and ii) the imperfection of the communication channel; the created secrets can be used as keys to hide the information about the motion intent. If the motion-planning is random enough, the eavesdropper will eventually lose track of the trajectory; even if the eavesdropper has unlimited computational power. The framework can be applied to the problem of way-point tracking, where the robot should visit some confidential target positions one after the other. Reference: Tsiamis, A. 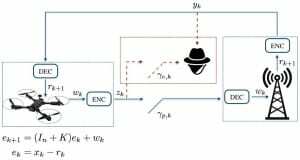 B. Alexandru and G. J. Pappas, Motion Planning with Secrecy, to appear at American Control Conference (ACC), 2019, IEEE. *Finalist for best student paper award.